Nshongi Camp, is the perfect location to start your Gorilla tracking, infact it's the only place in Uganda and in the world where you can track FIVE different Gorilla Groups, Nshongi, Mishaya, Kahungye, Busingye, Bweza. 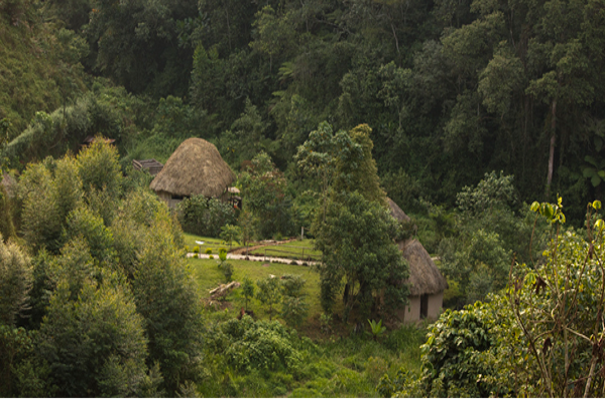 Nshongi Camp is just a few minutes walk to the Ugandan Wildlife Service hut, the starting point of the Gorilla tracking. The camp is located few meters from the edge of Bwindi Impenetrable Forest, a UNESCO World Heritage Site in southwest Uganda. Eco-friendly, rustic and warm, locally own, Nshongi Camp is known as the ideal base for Gorilla tracking, viewing and birding, several of the 315 birds species, many of them endemics and monkeys can be seen here. The camp has just 4 traditional bandas and is the perfect place for be connected to the nature or for a romantic stay. Guests can dine under the stars and relax by the roaring campfire. We serve 3 meals course, and we can prepare lunch box for your tracking. Hot coffee, tea, and drinks are always available. Rushaga area, is a village inhabited by the Batwa and Bafumbira communities, ask the camp staff to visit their communities for have the opportunity to experience a new culture. A local group called RUSHAGA YOUNG STARS can perform the gorilla dance for free directly in the camp.